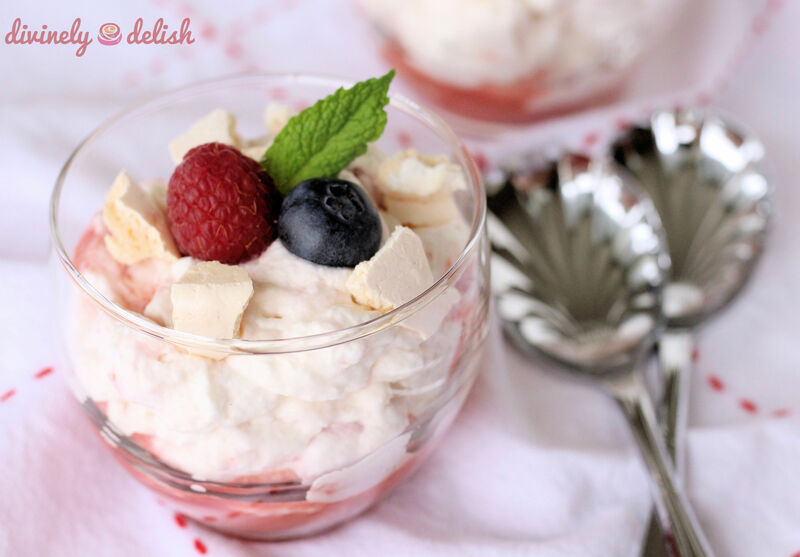 When I first found out what an Eton Mess is, I made a mental note that this traditional English dessert could come in handy one day should I ever experience a failed meringue. It’s always nice to have backup options, right? Not that I’ve ever had any problems whipping up egg whites. I’ve made lovely meringue cookies, and the first time I made Pavlova after I returned from a trip to Australia, it didn’t turn out too badly. So this time, when my friend Liz and her partner came back from Tasmania and wanted to arrange a “Tasmania photo night” and potluck, I thought Pavlova would be an appropriate, easy dessert choice. But just when you’re feeling confident that everything’s going to go off without a hitch, disaster strikes! First, I used liquid egg whites from a carton. Now, the thing is, I never ever buy this stuff! This was the first time, and only because I had a coupon for it and I wanted to make some paleo bread that required using whole eggs plus additional egg whites. To be honest, I was a little skeptical – these egg whites seemed way too watery. But the instructions on the carton said they could be used in any recipe requiring egg whites, so I went with that. I must’ve beaten the whites for a good 15 minutes, but I couldn’t get anything more than soft peaks! I then went online (something I really should’ve done beforehand!) and read about others’ experiences with carton egg whites, with some reporting that these can’t be used for making meringues! What a waste, but lesson learned! I then used regular egg whites for my second attempt, but for some reason, they wouldn’t whip up to stiff peaks either. I’m not sure what happened. It was a wet and rainy day, which probably didn’t help. I was pressed for time and I think I added in the sugar too early, and the egg whites couldn’t incorporate enough air to get the light, airy texture. I had been planning to pipe out small meringue “nests” to make mini pavlovas, but the batter was too runny and the “nests” couldn’t hold their shape. They collapsed into these big, foamy blobs. But there was no way I was going to start this all over again! So I baked them and decided I would now make Eton Mess! Surprisingly, they came out of the oven looking better than I’d expected. They rose quite a bit and now looked like thick smooth-topped meringue cookies. Crispy on the outside with a soft, chewy marshmallowy centre, they were incredibly tasty! 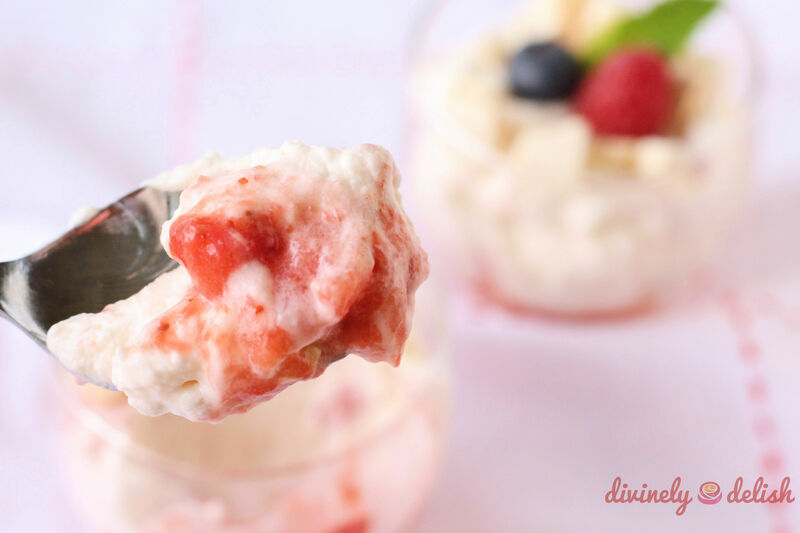 My Eton Mess came about by accident, but no one at the potluck needed to know that! 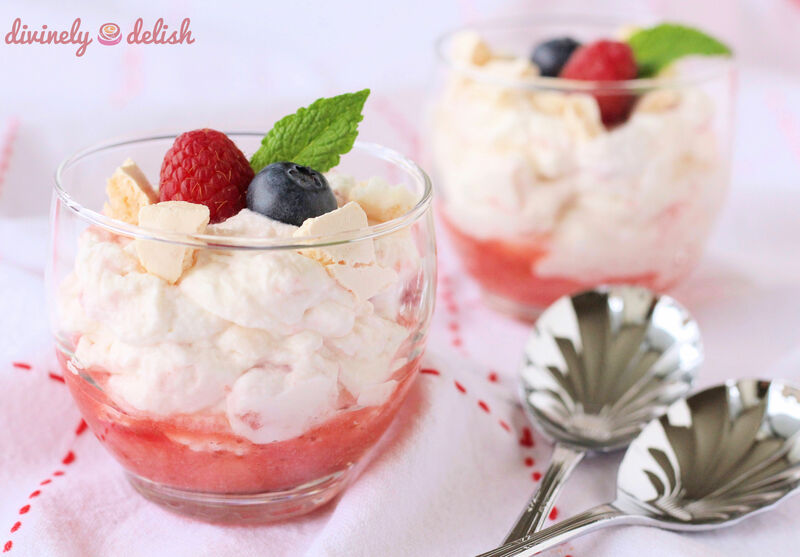 A disaster was averted and I discovered a delicious dessert – fruity, light and airy, with crunchy bits of meringue. 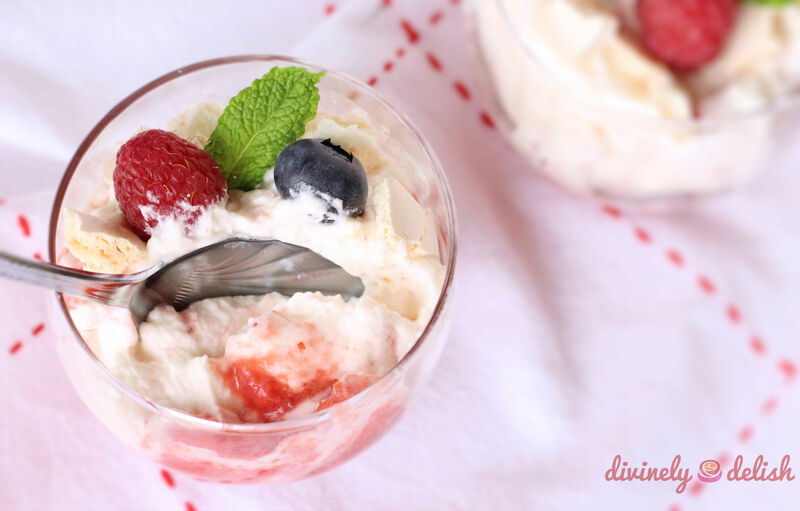 Served in tall glasses, this ultimate summertime dessert looks pretty impressive! The next time I make this, it won’t be by accident! I adapted this recipe from my Pavlova recipe, adjusting for a smaller quantity and baking at a lower temperature. You can always make the meringues a few days ahead of time. 1. Preheat oven to 225F (107C), with the rack in the lower half of the oven. Line a baking sheet with parchment paper. 2. In a large bowl, beat egg whites until stiff but not dry. Gradually add in the sugar, about 1 tablespoon at a time, beating well after each addition. Beat until thick and glossy. 3. Gently fold in vanilla extract, lemon juice, and cornstarch. 4. Pipe out or drop spoonfuls of the mixture on the parchment paper. 5. Bake for 1 hour 15 minutes. Then turn off oven, and without opening the door, let the meringues remain inside the oven for an additional 30 minutes. 6. Remove meringues from baking sheet and place on cooling racks. Once completely cooled, break up the meringues into bite-sized pieces. 7. Puree half of the chopped strawberries in a blender. Set aside. 8. In a large bowl and using a whisk attachment, beat whipping cream while gradually adding sugar, until you get medium-stiff peaks. Place in fridge until ready to use. 9. To assemble, gently fold about 3/4 of the meringue pieces, chopped strawberries and pureed strawberries into the whipped cream. 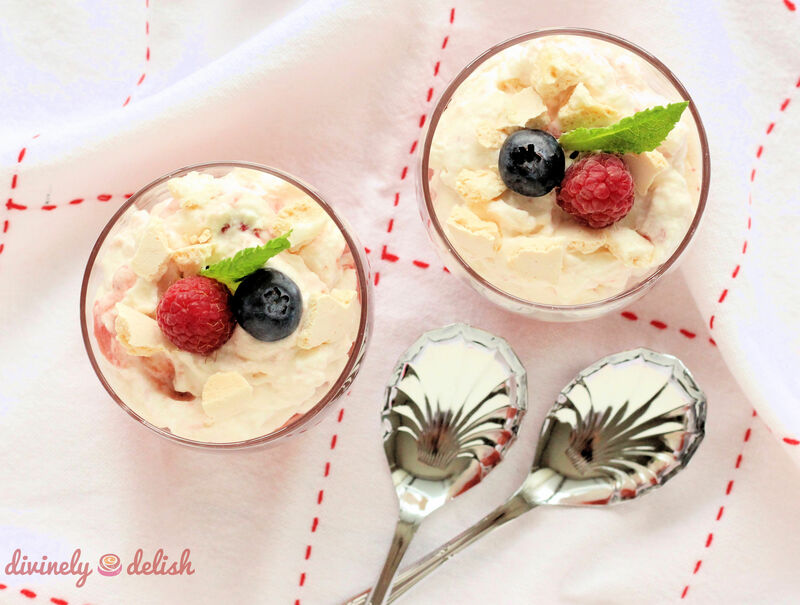 Spoon into glasses or bowls, and sprinkle the the remaining meringue pieces on top. For a more eye-catching presentation, you can also reserve some of the strawberry puree and pieces, and “layer” them into tall glasses.